Some of our greatest archaeological finds have happened by accident, revealing wonders from the past. 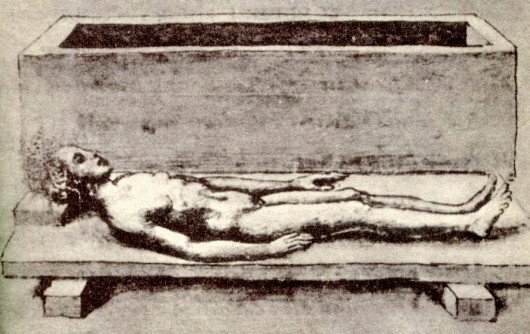 Such a thing could also happen in the Middle Ages, such as when the perfectly preserved body of a girl was discovered along the Via Appia just outside of Rome. The discovery took place in April of 1485. To explain the whole matter in order: some workmen were digging out the foundation of tombs in search of marble on the Via Appia six miles out of Rome. They had destroyed an arch faced with brick on all sides some ten feet down when they came across a marble box. Opening it up, they found a corpse lying on its face, covered by a layer of fragrant bark two inches thick; all of the inside of the casket was likewise smeared with the same fragrant mixture like some sort of plaster. When this sweet smelling bark was removed, the girl’s face (to begin at the top) was rather pale and as if she had been buried that very day. Her hair, long and dark and firmly fixed to the scalp, was gathered in a knot and divided into twin tresses in girlish manner, all covered by a hairnet of silk interwoven with gold. Then there appeared small ears, a short forehead, dark eyebrows, the eyes beneath shapely and bright. The nose was still intact, and so soft that if it was pressed by a finger it would flex and yield. The lips were a pale red, the teeth snow-white and small, the tongue from the roof of the mouth all scarlet. The cheeks, chin, and throat – you’d think they belonged to a living person. The arms hung down from the shoulders entire, and would followed wherever you led them. The hands were stretched out, the fingers rounded and tapering with translucent nails, and so firmly fixed that they could not be torn from the joints. Her breast, stomach and belly were equally broad, and appeared white when the fragrant bark was taken away. The nape of her neck, her back and buttocks retained their position and shape and graceful appearance. The beauty of her hips, thighs, shins, and feet likewise gave the impression of a living person. Another mystery is what happened to the body after she was taken to Rome? Some reports suggest that Pope Innocent VIII, perhaps displeased at all the attention this corpse was getting, ordered the caused the city officials to secretly take the body away and bury outside the city walls. Another version explains the body was just dumped into the Tiber River.